When people talk about the Fairphone they mostly mention the obvious additions Kwamecorp added to the Fairphone OS. These are the the dock which gets accessed by swiping from left or right into the screen and the widgets “Piece of mind” and “Your apps”. Also the root access is talked about a lot. But I also care about the many minor modifications that make life easier. For most of the differences I can’t tell whether they are introduced by the manufacturer A’hong, by Kwamecorp or if they are part of stock Android. [Edit]I think I missed the correct answer: Probably Mediatek – the chipset manufacturer – is the one who added the additions to the operating system. [/Edit] My perspective is one of someone who has used Cyanogenmod for years. Cyanogenmod added a lot of enhancements to the OS so sometimes I can’t tell how stock Android really looks like. Bear with me if I mix that up. To conclude that: Comparisons are between Fairphone OS (Android 4.2.2) and Cyanogenmod 10.2 (Android 4.3.1). 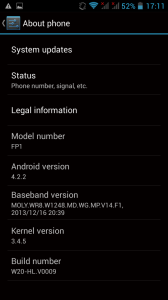 I also have access to a Nexus 5 running Android 4.4.2. So that is the baseline of comparison. One nice feature I really like is to have the battery level shown as percentage in the status bar. The little icon usually changes colour to indicate low battery. For me this is just not enough information. I want to see how long the phone is approximately going to last at one glance. Fairphone OS has that option built in. Just go to “Settings” > “Battery” and tick the first entry. Now a big bold number appears next to the battery symbol in the status bar. With all the other pictograms (WiFi, two SIM cards, etc.) this starts looking a bit messy but still it gives me the information I want. Still missing is the feature to configure which tiles are shown. 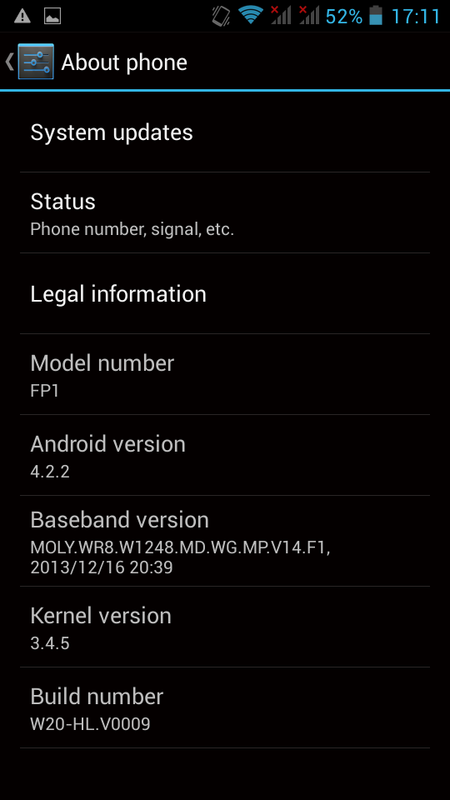 At least I didn’t find how to do that (Cyanogenmod allows that). But the added tiles make up for that. Even better these tiles now make a lot more sense since they just work as toggles. 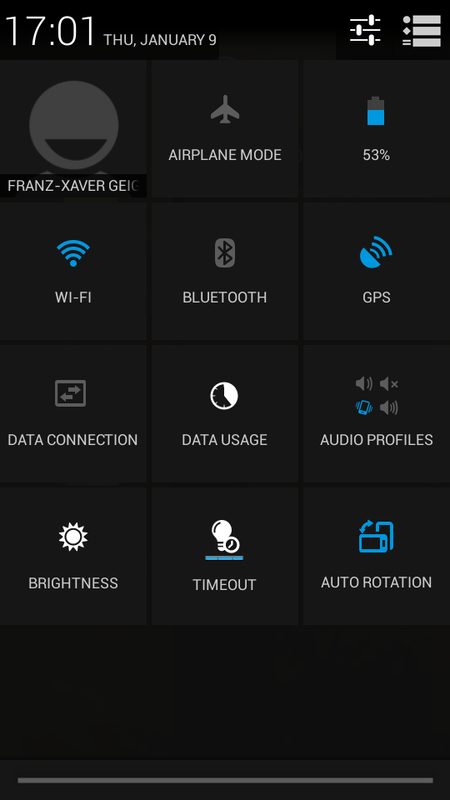 In stock Android most of the tiles work as shortcuts to the respective menu in the settings. 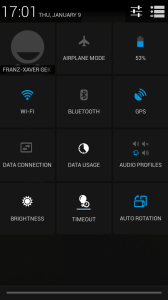 On Cyanogenmod and Fairphone OS these tiles toggle the state of the setting. So if I click on the wifi symbol, I can toggle wifi on and off. Nice. 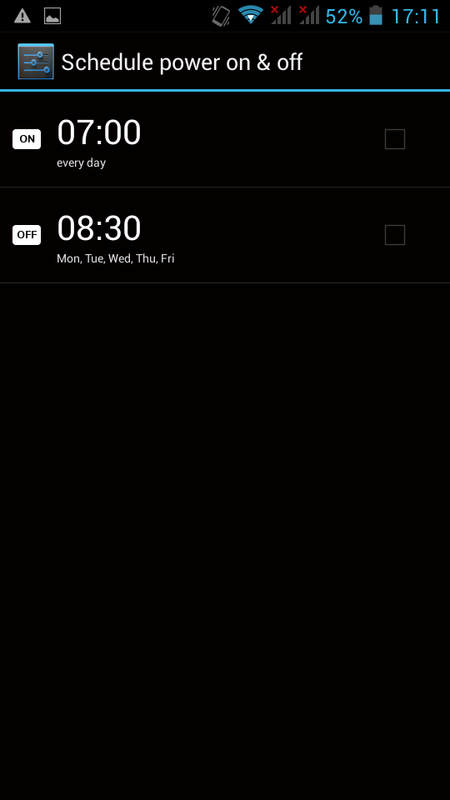 Back in the days of the feature phones (which lasted weeks on one charge) you could set your alarm before going to bed and then switch your phone off. It was smart enough to just turn on at the right time and wake you up. The smartphones I used to far lost that ability. They only ring the alarm if they are turned on. 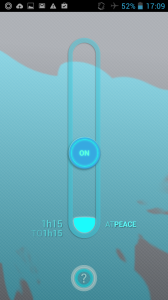 The Fairphone brings back this handy feature. Turn off your Fairphone during the night to save battery or whatever. It will boot up to make sure you don’t miss your bus. If you’d like to be even more in charge when your phone is on and off you might be glad about the next option. Do you have friends who call you in the middle of the night to ask if you are up to go out. I heard people say that happens sometimes. 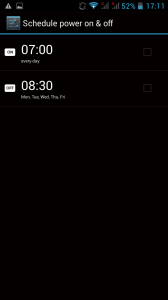 To make sure I get a good nights sleep when I need it I turn off my phone sometimes. If you want to do this every night you can now let your phone do that automatically by itself. In the system part of the settings there is the option to schedule when your phone should power off and power on again. I didn’t try it yet but to have the option is a nice. 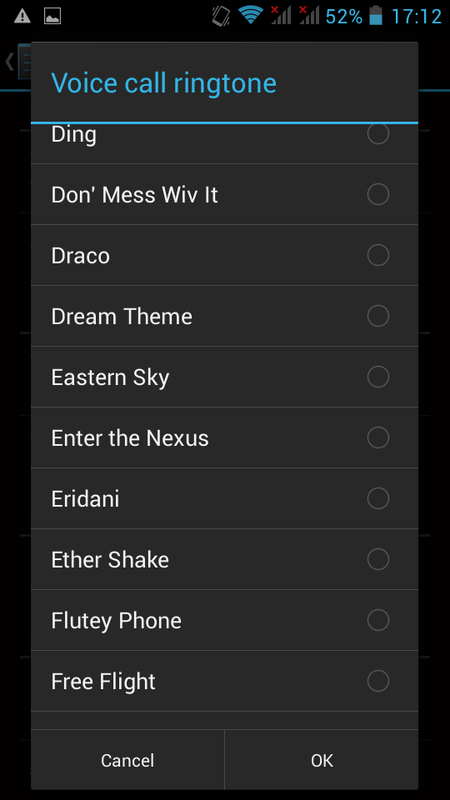 Probably most smartphone manufacturers include a ton of ringtones on their phones. Cyanogenmod doesn’t. 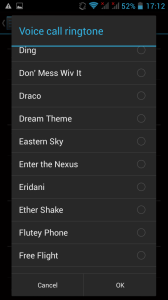 So I feel really spoiled when I look through the long list of ringtones included on the Fairphone. And there is even some decent ones. One thing I rather don’t like is the partitioning of the built in storage. In addition to the The phone has two different partitions: Internal storage and phone storage. That unfortunately limits the number of apps one can install. Of course you can always move apps to the other partition. But I’d rather be spared that hassle. 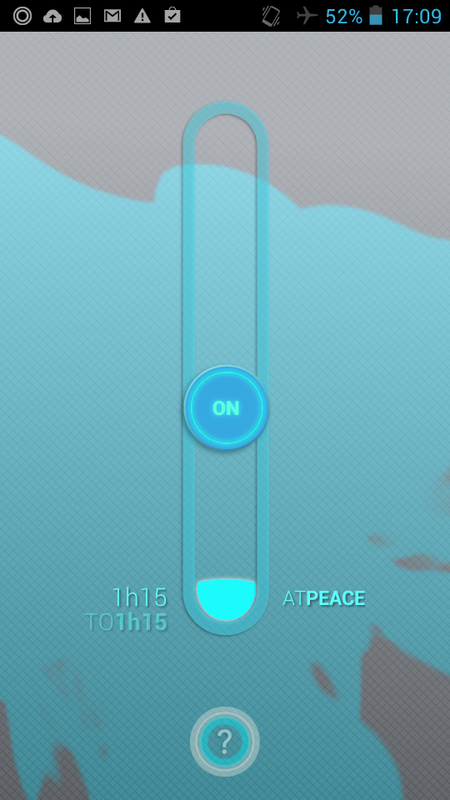 This concludes my list of the small but nice surprises included in the Fairphone package. If you have anything to add or want to elaborate on a point, feel free to drop me a note. It’s stock android. I also like it. It’s particularly helpful if you have a pattern or PIN to unlock your device. With the lockscreen widgets I don’t need to unlock but can still access information quickly. Of course this also let’s anyone else access my information without knowing my pattern or PIN. So this is only an option if I don’t mind that people could see that information. Hey, thanks for your article! Does it refer to the Fairphone 1 thou? I cant find the scheduled powering off and on in the systems setting… Thanks for your help!